Sometimes I get this over whelming sense that I am alone. I guess Alone is not the right world. I have my mom who I get to hang with every and of coarse my amazing boyfriend that I get to see everyday and consider myself very lucky for being able to do that. I guess maybe it is a little bit of that social media envy thing. I see people I know going out with groups of friends for dinner, parties, group vacations, road trips and those types of things and it makes me feel very envious of what they have. I wish I could just go to my friends and say, ” hey guys want to go to Mexico?” Instead it just seems like we are all living our own separate lives and we keep in touch with each other just enough to not feel so god dam alone all the time. How do they find the time to do it, to stay in touch with each other? Maybe they don’t have any more time than me maybe my priorities are just not in the right place. I am not really sure where I am going with this blog now, but I am sure it is not the last time that I write about this topic. I really think that something major just happened on the planet yesterday. I know you are going to laugh but it was caused by the Tumblr Post about the Dress. I am sure by now, unless you are living under a rock, you know exactly the dress I am referring too. For those of you who missed out The following picture of a dress was posted to Tumblr and went mega viral over night. The reason the dress went so viral is because so many people disagreed on what they saw in the picture. 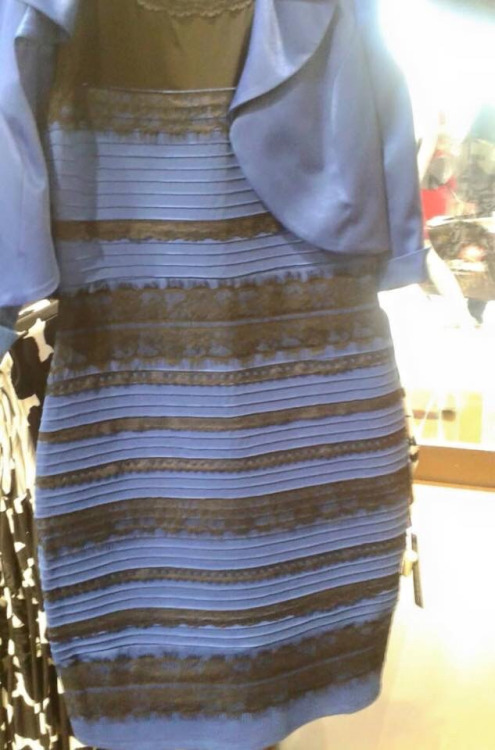 Some people (the right people) saw the dress as some shade of Blue with either a black or brown lace stripe on it. Now somehow(don’t ask me how) the majority of people actually saw the dress as White and Gold. Now this is what I think has happened and will continue to happen in the aftermath of all of this nonsense. The dress will actually cause people to question the reality that they are living in. If I could say with out a doubt that the dress was one colour, yet the person right beside me saw something completely different, what else do I believe to be true that is in fact not true. Is what I think blue is actually blue at all? What about taste do the strawberries I eat taste the same to you as they do to me? Maybe that is why we can love a food yet other people hate the taste of that very same food. It might not even stop there take religion for example you might believe with all your heart and soul that your religion is true and that what you have been taught is the TRUTH. Somehow though the guy living next to you believes with out a doubt that the religion he believes in is the truth and that you are wrong about what you believe to be true . How can the two of you both know what you believe is the Truth? Maybe because both of you are in fact right? or maybe you are actually both wrong. I am not sure we will ever really know for sure. What we can take from this and should learn from this is that we all persevere the world in a sometimes very different way. So maybe we should not get so upset when someone believes something different from what we believe to be true. Maybe the Blue/White Dress can in the end bring us all closer together.